Sift together the flour, baking powder, salt and sugar. In another bowl whisk together the egg, milk, peanut butter and melted butter. I actually use a hand blender to do this, so the mixture is smooth (it’s hard to mix in the peanut butter with out it). Then add the milk mixture to the flour mixture, and lightly combine. As always with pancake batter, it can be a little lumpy. Let the batter sit for about 5 minutes before you cook the pancakes. You will notice that the batter will fluff up a lot. Cook the pancakes on medium heat grill. We have made these pancakes with whole wheat flour too, and they are good. Not quite as fluffy, but they are tasty. I just used 1/2 cup white flour and 1/2 cup whole wheat flour. 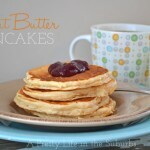 These pancakes are amazing served with jam, or syrup, or even just butter!